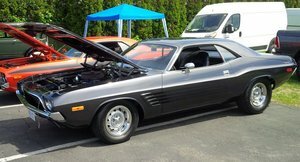 This Awesome 1970 Dodge Challenger T/A is in great shape and runs as good as it looks. It come with the numbers matching 340V8 Six Pack mated to a Torqueflite Automatic transmission and 3.55 Suregrip rear end. This car was tore down and restored with the engine rebuilt .30 over. Very clean inside and out and drives great. Belived to be actual miles and Comes with a build sheet and Grover report .